New Year foil Treasure tokens with Alternate Art representing the "Money tree" in Chinese mythology on the front and a dog to celebrate the Year of the Dog on the back, inside red envelopes (hongbao) with the illustration of Revel in Riches from Ixalan by Eric Deschamps. Red envelop and Treasure Token. Red envelops and Treasure Tokens. 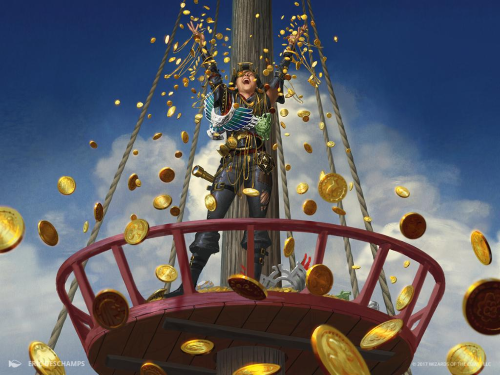 Revel in Riches full art from Ixalan by Eric Deschamps.